Isn't it beautiful , can you see the little mouse and gardening tools ? Oh that's so lovely, lulu is an exceptionally kind lady! And talented too! Mushy /David , hello stranger ,where have you been ??? How absolutely wonderful! It has so much charm, and the colours are so pretty! Well done Lulu! It's lovely to make something for a friend you haven't even met!!!! You are very welcome Amy...you sent me such an exciting package in the post of your bits and bobs. It's such a surprise nowadays to get anything other than a bill in the post! I'm thinking of sending my folks a surprise package, as they don't often go to a certain supermarket! And I know they keep needing to renew their washing up brush refill thingy's....if you know what I mean...fill the handle with washing up liquid and the brush end is replaceable!! That is really pretty, Lulu! Wasn´t that metal fairy used also in another of your works, Lulu? When I saw it, I immediately knew, it is your work. And I agree, it is nowadays a big surprise to get anything else then bill in the post or blow between eyes, lol. and very generous too! i have a beautiful mosaic from lulu which she made for my new pond! I remember your mosaic Sticki didn't you help or make one yourself ? I had help to make one but I also have one that is really lovely ~ made by lulu! it has 3 fish on it ~ i love it. What a lovely, lovely gift to receive. A very talented Lulu, have seen some of you other mosaics on here, clever ole thing you. Brill, loving the mouse, got one of my own in the poly cave. But your'e on with a gate stop Stevie!! I did pick up a wee motor bike charm...with you in mind! 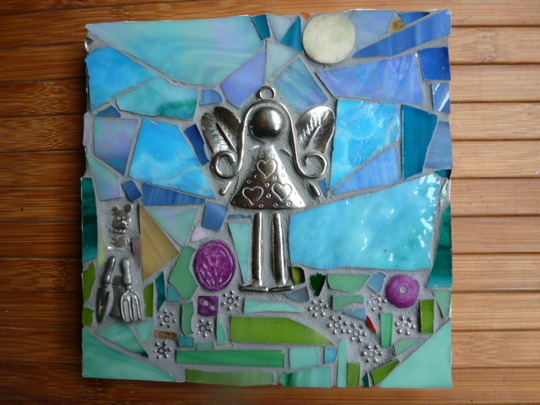 Just finished 3 more little mosaics...my favourite so far...kind of want to keep them but need sales really!!! Also made another Marmite jar with a mosaiced teaspoon at the side of it! How lovely , Amy . What a special gift , Lulu . oooo me in mind : ) so what type of gate stop would you like? something that will hold a gate back and is flat enough to mosaic! Or a door stop...if ya need one! Oh that is gorgeous Amy!! How lovely and such a beautiful gift from Lulu.....those are heavenly colours too, now the little angel there, I reckon that's you Amy! Love the mouse and the gardening tools.....just fabulous! It is really gorgeous and I love the colours and the little garden tools and tiny mouse - you must be thrilled to bits with it.